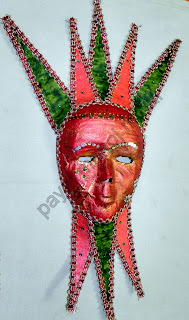 hi friends, how is this mask made by me? Your blog will look very nice, if you arrange the stuffs properly. This is a friendly suggestion, don't take it negatively. Waiting to see some more works from you. THANKS DEAR 4 UR VALUABLE SUGGESTION. hey.its awesome.rthe other works above 2 made by u? well plz check my blog 2 and leave some suggestions.